We are a leading Manufacturer of embossed polycarbonate solid sheet, pc embossed sheet, polycarbonate uv sheet and embossed polystyrene (ps) sheet from Rajkot, India. Being the most respected organizations guided by experienced and knowledgeable professionals, we provide an enormous assortment Polycarbonate Embossed Roll Sheet.Provided PC sheet is manufactured by our domain-experts utilizing high grade material and progressive machinery. Clients can buy this PC sheet from us in varied specifications. 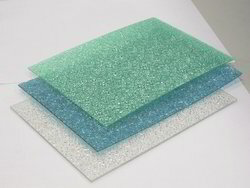 TILARA PC Embossed Sheet offers a unique combination of material properties that makes it superior to other thermoplastic material or glass, making it the ideal product for roofing, glazing and fabrication. PC COMPACT SHEET has high clarity and good performance for application where good visibility is important. It also has excellent temperature performance which gives good fire properties, the material is even self-extinguishing. Compact PC is well suited for thermoforming or machining. It provides unbeatable impact resistance, 200 times stronger than glass, providing protection against breakage and shattering. It easily withstands a blow a hammer, hence it is extremely suitable for use in safety glazing applications also in applications which require enhanced shatter resistance protective screening. Special resins are used when food approval or flame retardant characteristics are needed. PC EMBOSSED ROLL: TILARA PC Embossed Roll has several characters with high impact resistance, light weight and can be easy cold bend processed and hot molding can be done. Hence, it can be widely used in construction and decorations. TILARA POLYCARBONATE COMPACT SHEET: offers a unique combination of material properties that makes it superior to other thermoplastic material or glass, making it the ideal product for roofing, glazing and fabrication. PC COMPACT SHEET: has high clarity and good performance for application where good visibility is important. It also has excellent temperature performance which gives good fire properties, the material is even self-extinguishing. Compact PC is well suited for thermoforming or machining.It provides unbeatable impact resistance, 200 times stronger than glass, providing protection against breakage and shattering. 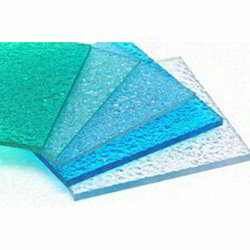 It easily withstands a blow a hammer, hence it is extremely suitable for use in safety glazing applications also in applications which require enhanced shatter resistance protective screening. 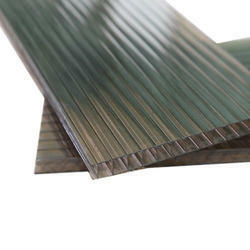 Special resins are used when food approval or flame retardant characteristics are needed. Our company has relentlessly pursued excellence in its endeavor by providing premium quality Embossed Polystyrene Sheet that are commonly installed in the windows of commercial & residential establishments. These sheets are manufactured with the use of best in class plastic and advance machinery. To meet the different needs of our esteemed clients, we provide these plastic sheets in several sizes, colors and dimensions. 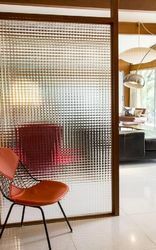 Looking for “Embossed Polycarbonate Sheets”?